Mrs. Yollis' Classroom Blog: Here is Our 21st Century Symposium Presentation! Here is Our 21st Century Symposium Presentation! 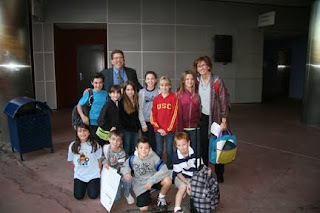 On Friday, October 23, Mrs. Yollis and ten of her students gave a presentation at the 21st Century Learners Symposium. Below is a slideshow of the day's events! Here is a video of the actual presentation! Thanks Mrs. Yumkas for filming us! What do you think of our presentation? You guys did a great job presenting - it looked like it took lots of preparation and practice, but I know when you do something you enjoy, it sure is fun to tell people about it. Your participation in the symposium was brought up at our school board meeting this evening, and we are all really proud of Mrs. Yollis, your whole class, and Chaparral! I think the presentation was amazing. When you were there was it an honor? Also was it fun? If I was in your class last year would be so happy if I was there. Hope you go there next year! I was so impressed with all the student presentations. Your suggestions for how to create good blog postings and comments were so well thought-out and clearly explained. I am teaching 7th grade at Lindero Canyon Middle School this year, and I am having all my students participate in both a class blog and individual blogs. We are in the process of getting all these going right now. Today, I was focusing on good comments. I realized when I saw your presentation video last night that your suggestions did a better job of explaining what constitutes a good comment than I had prepared myself. I showed my students part of your video today, and they loved it! I embedded the full video in my own blog today, and I bet a lot of my students will watch the complete video. You should be very proud that you have helped me teach my 7th graders an important lesson. Congratulations Mrs Yollis and the wonderful students who were involved in the presentation. You did a fantastic job! Hope you're all having a great halloween today! We don't celebrate halloween too much in Australia but it sounds like a lot of fun! Great job! I enjoyed seeing the students and their presentation. They did an outstanding job of explaining how they create posts to the classroom blog. I had so much fun at the symposium! Congratulations on your presentation and the resulting award at the 21st Century Learning Symposium. You and the students gave a very informational and enthusiastic presentation. Sydney and I enjoyed watching the video. Perfection!! I appreciate you all--it was a BIG audience to present in front of and you really hit the mark. Thank you!